Over the years, a veritable plethora of illustrators have taken a turn at Alice’s Adventures in Wonderland. From time to time, I will feature some of my favorite Alice artists on this blog. Where better to start than Willy Pogany? Vilmos Andreas Pogany was born in Austria-Hungary in 1882. I had to look up Austria-Hungary, because I am ignorant about European history and as far as I knew, Austria and Hungary were always separate entities and not hyphenated co-countries. (Austria-Hungary only existed from 1867 to 1918, when World War I put a damper on that union. In case you were wondering as well.) Vilmos studied art in Paris and worked as an illustrator in London for a decade or so, at some point changing his professional moniker from “Vilmos” to the catchier “Willy.” In 1914 he moved to the hyphenated kingdom of United States-Canada. I KID. He moved to the un-hyphenated* US where he continued his successful career, illustrating books and ads and magazine covers and even working as an art director in Hollywood. Pogany’s trademark style was, he didn’t have a trademark style! He was incredibly versatile and could do everything from pen and ink to watercolors, from fairy tales to ladies’ magazines. In 1929 Dutton published Alice’s Adventures in Wonderland by Lewis Carroll illustrated by Willy Pogany. What Makes This Alice So Special? Well for starters, she’s a flapper! Alice wears a fashionable bob, plaid mini skirt, knee socks and looks a little older than previous Alices. In a word, she is sporty! She looks like I have always pictured Jordan Baker from The Great Gatsby. Here she is chatting with Cheshire Cat. Cheshire Cat has a rather giddy grin, yes? Care for a better look at the Cat? Not gonna lie, kinda scary. Don’t worry, we’re all cringing at the Cook. Longest table ever! Also, worst scan ever. Sorry about that. My personal Pogany fave? When Alice crowds the criminally cute Dormouse in the courtroom. Girl can’t help it. She’s growing! Speaking of cute, check out Pogany’s baby-turned-pig! I’m sorry, did you say pig or fig? The piece de resistance? The king and queen’s attendants as showgirls. COME ON!!! What do you think of Willy Pogany’s flapper Alice in Wonderland? If you love it like I do, rest assured, you have access to the rest. 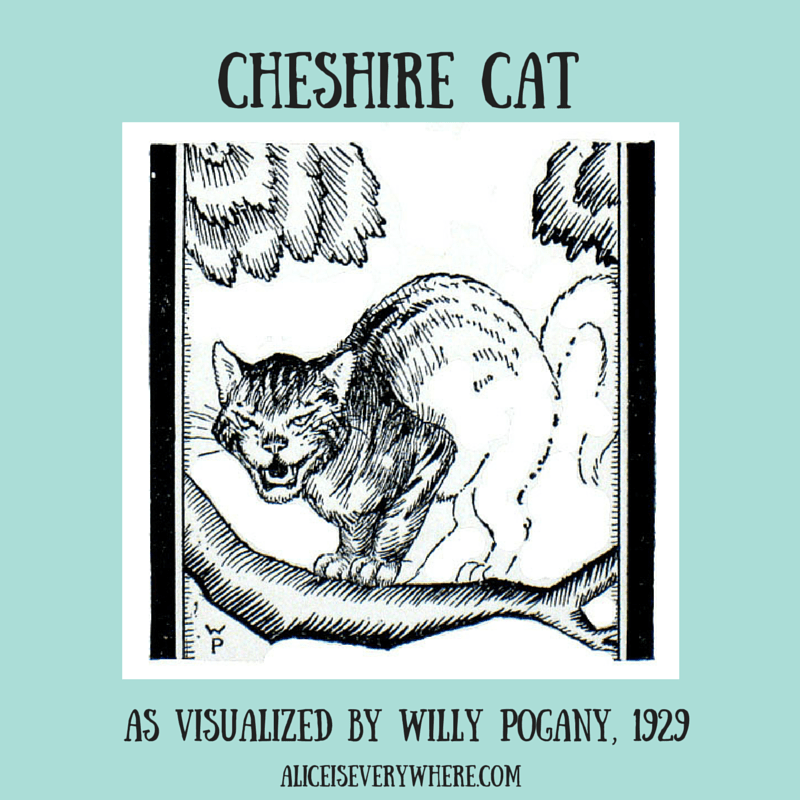 Alice’s Adventures in Wonderland illustrated by Willy Pogany is available on Amazon in paperback for the bargain price of $6.99 (as of this writing). If these utterly charming pics don’t make you want to bob your hair, drink a Sidecar and dance the Charleston with a Dodo, I don’t know what will! * Does it blow your mind the way I put a hyphen in un-hyphenated? It blew my mind.